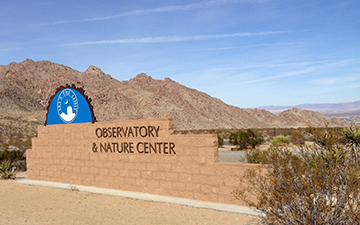 Sky’s the Limit Observatory and Nature Center (STL) in 29 Palms invites stargazers to explore the cosmos on Saturday nights (except during a full moon), for free star-viewing events. Take a tour of the night sky with volunteer astronomers and see stars, planets, constellations, and the ethereal Milky Way. This FREE public event begins after sunset and ends between 9 p.m. and midnight, depending on the season. Monthly Star Viewing events are listed on our Calendar of Events, or find the monthly star viewing schedule at www.skysthelimit29.org. The Observatory is at 9697 Utah Trail in Twentynine Palms, just outside the main (north) entrance to Joshua Tree National Park. STL has a variety of types and sizes of telescopes set up for viewing on the winding sidewalk at the site, along with the 14″ Celestron telescope in the observation dome. Guests are welcome to use the telescopes, or bring their own binoculars and scopes as well. Pads are provided for telescope setup. Guests are encouraged to come around sunset to have time to get familiar with the campus and visit other educational attractions before stargazing begins at dark. The presentation is very casual, so come at any time and leave when you wish. Bring a red flashlight to preserve night vision. Red lighting is the preferred lighting at astronomical facilities because white light adversely affects night vision, which in turn affects viewing through a telescope. Please be aware that white vehicle headlights severely disturb viewing, so use only parking lights as you approach the dome. Let your eyes adjust to the dark before you drive into the parking area. The 15-acre campus is at 2800 feet, so it can be chilly, even in the warm months. Everyone should dress for unpredictable desert weather and bring snacks, water bottles, and chairs. There are restrooms but no running water on campus. There are no overnight stays and NO CAMPING anywhere on the STL Observatory and Nature Center property. No pets, no smoking or alcohol allowed, and visitors must carry out all trash. Adults must accompany and take responsibility for the safety and behavior of children under 16. The seasonal sky is very unpredictable and an event may have to be delayed, rescheduled, or cancelled due to cloudiness, rain, or excessive wind. Check Sky’s The Limit Facebook Page or follow @STL29Palms on Twitter to learn the latest status of an event. Or call RAY YEAGER at (760) 365-7897. For more information and to see photos taken through STL’s 14” Celestron Schmidt–Cassegrain telescope, visit the STL website at www.skysthelimit29.org. STL is a tax-exempt nonprofit organization. Donations to support Sky’s The Limit’s educational programs are gratefully accepted. 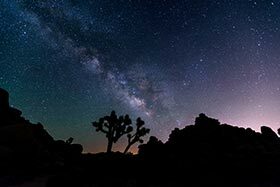 The Night Sky Festival is a one-day event that celebrates Joshua Tree National Park’s night sky and its status as a Dark Sky Park. This annual all-day fundraiser includes morning and evening events, plus a special Astrophotography Workshop starting on Friday night. Saturday is a star-filled day with multiple sessions…some are for pre-purchased tickets, others are free. Add-ons such as boxed lunches, VIP Parking, Glow-In-The-Dark T-shirts will be available during online purchase of your tickets. Events are held at Sky’s The Limit Observatory & Nature Center and the Community Center and Patriotic Hall in Luckie Park, Twentynine Palms, CA. For tickets and more information, go to www.nightskyfestival.org. Tickets include a shuttle from Luckie Park in Twentynine Palms to Sky’s The Limit. For people with disabilities, accessible transportation will be provided by contacting us at contact@skysthelimit29.org. If the event is cancelled due to circumstances beyond our control, ticket costs minus an administrative fee (not to exceed $5) will be refunded. Tickets are limited, so get your advance tickets early! NO TICKETS SOLD AT THE DOOR. 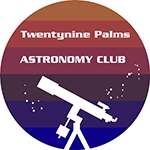 Twentynine Palms Astronomy Club offers private stargazing events at a location of your choice. Private star parties are evenings of stargazing with telescopes, binoculars and laser constellation tours lead by our expert astronomers. Lessons in astrophotography using DSLR cameras or an iPhone are also offered by the astronomers, with instruction in taking various forms of astrophotography including Milky Way star field shots with a traditional camera lens and tripod, or through-telescope pictures of deep sky objects. You must provide a camera, lens or smart phone. Tripods, telescopes, and adapters for Canon and Nikon DSLR cameras will be provided by the astronomy club. Want To Enjoy The Night Sky? …and explore the universe from your backyard or campsite or lodging location? Download the app SKY VIEW on your smart phone, and … Voila! See the constellations and planets, identified by name and sky position, right in the palm of your hand.